After a couple weeks on the road for work and a family emergency, I made it home for a day and a half before we left again. We had a vacation planned and it’s something we had been looking forward to for months. Once again this year, we rented a cabin at Kingfisher Cove in Saugatuck. We invited my parents and J’s parents to join us to spend time with their granddaughter and to split the cost a three ways. J, L, and I made it to Saugatuck first. Makes sense seeing as we’re the closest. Next up was my parents. J’s parents were pretty late because J’s dad needed to work a full day before heading north. We decided to order pizza the first night. We were hanging out on the porch playing with L and waiting for J’s parents. Those of us that were there were hungry and pizza would stay pretty good so J’s parents could eat when they get there. J suggested we order from the same place we did last. Lakeshore Convenience Store. I pulled open the book of menus the cabin leaves to pull it out, but I found another one. J and my mom wanted some breadsticks and a salad too and Lakeshore doesn’t do those. I pulled out a menu for Back Alley Pizza Joint and we started looking over that. We decided the pizza from Back Alley looked good plus they had the extra stuff we were looking for. I put in an order for a large BBQ Pork Pizza, a large cheese and sausage pizza, a large traditional salad, and a whole order of garlic cheese bread. The order taker told me it would take about twenty minutes. My mom and I made the drive across town to Douglas to pick up the food. 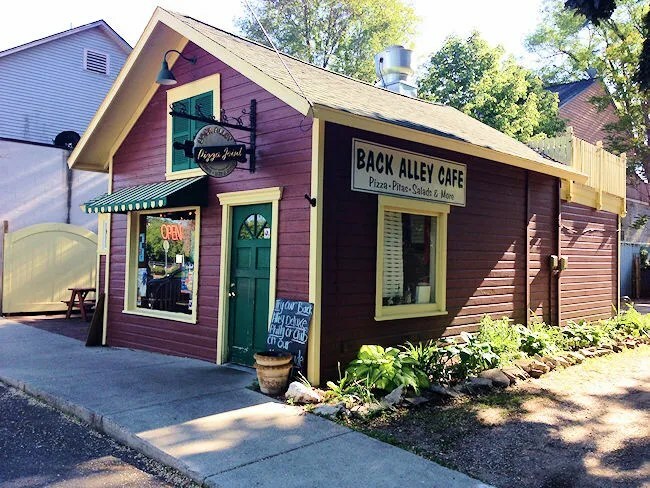 Back Alley Pizza Joint is on Main Street which isn’t quite the main business district in downtown Douglas. Most of the businesses are on Center Street and Main Street intersects with that street on the east end of downtown. 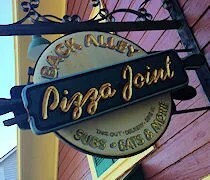 Back Alley Pizza is just around the corner to the north from the Main and Center intersections. The small joint isn’t much bigger than a kitchen. It’s a cute little building, but there is only a little outside seating and maybe one or two tables on the inside. My pizzas were ready when I walked in and the bill came out to a little over $50 which I paid in cash because my mom handed me money as I was getting out of the car. When we got home, I was met at the door by a bunch of hungry people ready to dive in. I ordered a pizza off the specialty menu because three of us thought it sounded delicious. The BBQ Pork pizza turned out to be just as delicious as it sounds. 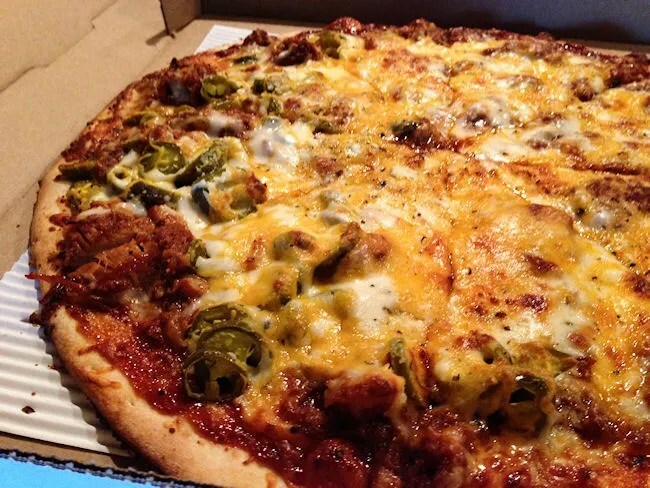 The pizza is topped with BBQ pulled pork, a sweet BBQ sauce, mozzarella cheese, cheddar cheese, and jalapenos. We only got jalapenos on half the pizza because J didn’t want any….but man, did she miss out. The crust on this pizza didn’t have a chance. It was a thin and crispy crust, just the way we like it, but it just fell apart under the weight of the toppings. This pizza was loaded with juicy, smoky pulled pork and a super sweet BBQ sauce. This pizza was pretty awesome. My dad and L dug in to their halves of the other pizza. Like ours, their pizza was on a pretty thin, crispy crust and it was loaded with toppings. 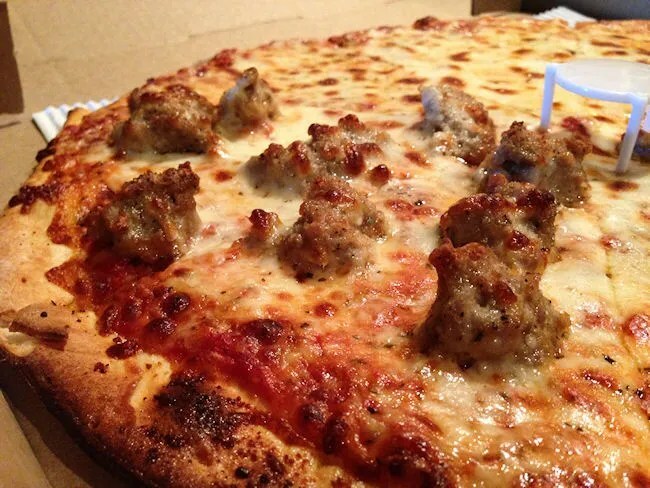 The sausages were big pieces of meat which my dad really liked and L loves all kind of pizza. For a little girl, she can really put away the slices. 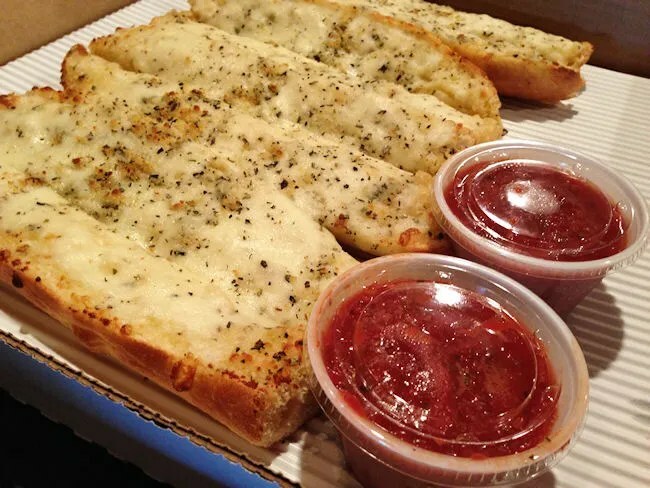 The garlic bread was kind of a surprise in this order. They were delicious. Instead of full pieces of bread, they were kind of in the shape of long boats and the just filled with a cheese and garlic mixture. I thought we were going to have to fight over these. They came with a marinara dipping sauce, but I just went without it. They were good without it. The Garden Salad was nothing to really write home about, but we did get several meals out of it. At dinner, J and my mom both had a little bit. It’s a simple romaine salad topped with tomatoes, green peppers, onions, cheddar cheese, and seasoned croutons. We chose Raspberry Vinaigrette which was packets of Newman’s Own. It was simple and that’s all it needed to be. We just needed some greens. When we started the night, we were content with just going back to where we ate last year because we liked that one so much, but at the end of the night, we were all pretty stoked we ordered from someplace new. Back Alley Pizza joint was a great selection. The pizza was delicious and not to badly priced considering how much food we got. If we keep up this Saugatuck vacation tradition, Back Alley Pizza will likely remain a part of it.